Family-owned and operated since 1986, Bellwether Farms is located in Sonoma County, California, about an hour's drive north of San Francisco and just a few miles from the Pacific Ocean, in some of the finest dairy land in America. They established the first sheep dairy west of the Rockies, and their flock continues to graze on the bucolic hillsides surrounding the farm. Bellwether Farms is committed to making the very best cheese and cultured dairy products using full-fat milk from local Jersey cows and natural, whole sheep milk with its abundance of nutrients and good fats intact. Their award-winning cheeses and yogurts are found in retail and specialty cheese shops and favored by chefs in many of the finest restaurants. As the cheesemaker-owner of Bellwether Farms in Sonoma County, Liam Callahan has developed a collection of fresh and aged cheeses that reflects traditional craftsmanship but also gives a nod to contemporary California culinary trends. Under Liam's direction, Bellwether Farms cheeses have won several national and regional awards, including two first place awards at the prestigious American Cheese Society judging, and have become a favorite of many California chefs. Its cheeses are found on the menus of many of San Francisco's and Northern California's most respected restaurants. Carmody highlights the buttery flavor and naturally golden color of rich Jersey cow milk. This amazing milk is produced by cows on neighboring dairies. 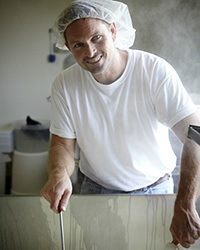 The name Carmody comes from a road that winds through the coastal hills near Bellwether Farms. This cheese melts great on grilled cheese sandwiches and quesadillas and pairs well with pinot noir, chardonnay, dry cider, or a malty brew such as Porter.